Frank Perely Fairbanks was a classmate of Phimister Proctor’s, the famous American sculptor, at the American Academy in Rome. Fairbanks who himself was a portraitist admired Proctor greatly. So much so that he painted a monumental portrait of Proctor. Karen McWhorter, the curator of the Whitney Western Art Museum, said the painting doesn’t only portray Proctor but his family as well. 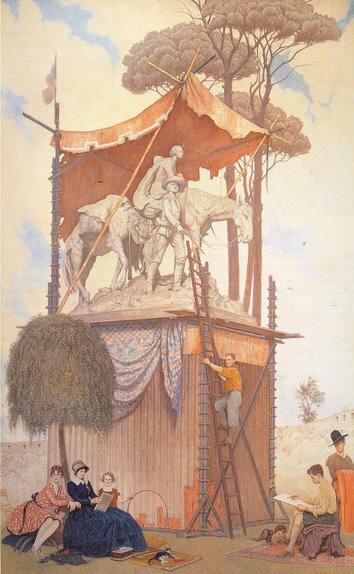 Fairbanks named the painting An Apotheosis of A. Phimister Proctor, suggesting the sculpture depicted in the painting (Pioneer Mother) was Proctor’s crowning accomplishment of his career. The artwork which already stands 10 feet tall will become even taller after conservation. McWhorter said there’s another foot of canvas on top of the painting that was folded over at some point. “It was damaged at some point so instead of cutting it off, they just wrapped it behind the canvas and stapled it on. We’ll send it off to be conserved, extend the canvas and repair it so it will be more than 11 feet tall,” said McWhorter.